The hard products were far from class leading, the soft product on-board was lacklustre, the lounges were tired and the staff were disinterested. What a difference a decade makes!. I'd argue that still mostly describes Qantas today. Sure a few planes, lounges and staff are up there.. but in general it has issues. It's just that the same applies to Virgin these days. I think Borghetti had little option to go upmarket as Jetstar and subsequently Tiger came into the market with lower cost bases. It's just that they squandered the new upmarket image and lower cost base. In my mind Virgin made a few strategic missteps over the period. But it's also just growing pains (same as JetBlue in the US is going through). What 'issues' do you think Qantas has today? They're not perfect, nobody is, but they are in a better place today than they have been in years and years. I think that VA made two major mistakes. The first was not properly defining their strategy, and the second wasn't being more aggressively in hitting Qantas when they were down. Both are a result of a lack of vision and ambition IMHO. To the first point VA claim to be a full service airline, and their Business Class product is admittedly pretty decent. In Economy though they offer the service that Brucetiki identified, a protein ball the size of your finger nail and water/juice/tea/coffee. They serve alcohol in 'happy hour' from 5-7, yet when I go to Sydney for work I'm inevitably on a 19:05 departure home ... water or juice? An alcoholic beverage isn't a big deal on a short flight, but when QF are serving hot meals and beer and wine on flights departing at the same time the whole 'premium' product thing seems laughable. VA have managed to wedge themselves somewhere between JQ and QF which is just about the worse place to be. A jack of all trades and master of none. Secondly VA came about during the darkest days in Qantas' history. Alan Joyce gambled with shutting down the airline, he went all in and won, but history could have been very different. For all the tears on the TV news for holidays ruined, weddings missed etc the people who QF stood to piss off the most were their corporate customers and high status frequent flyers who rely on Qantas to be able to carry on their business and do their jobs. VA ran some status matching campaigns, but mostly just sat back and assumed that QF passengers would walk across the street out of frustration. For the most part they didn't. Qantas was gifting them a once in a lifetime opportunity to pick off their upset customers, yet VA somehow failed to seize the opportunity. Which is a real indictment as Virgin Blue was renowned for their culture. That has been totally lost over the past 10 years, and now Virgin Australia don't appear to stand for anything other than not being Qantas, but wrap it up in red and purple to try and cling on to that 'Virgin-ness'. It looks increasingly hollow and fake IMHO. 10 years ago Qantas were a fuddy-duddy old airline with a complacent attitilude born from a lack of domestic competition and an illusion of former grandeur. The hard products were far from class leading, the soft product on-board was lacklustre, the lounges were tired and the staff were disinterested. What a difference a decade makes! There is a palpable energy and enthusiasm at Qantas these days that I have never seen before. The products are being reinvigorated, exciting new routes are being launched, and the staff are (mostly) enthusiastic and clearly proud of their airline. I've said it before and will continue to say it, I loved Virgin Blue but cannot stand what they have morphed into. Staff conduct at VA needs a big kick up the backside, and hopefully the new CEO provides the kick most of their staff need. Currently VA staff do all they can to avoid passenger interaction. They hide in the galleys during boarding, and God help you if you dare show them your boarding pass (oh God, they actually have to do their job and greet passengers). You then get the privilege of being treated like a nuisance for the duration of your flight as a protein ball is hurled at you, and you're reluctantly offered an extremely limited range of drinks on flights (water, juice, or tea and coffee - and of course tea and coffee leave the menu if you hit turbulence). If you're lucky you'll get one of the sealed hospital-style cups of juice. If you're unlucky, you get a small cup of juice. Then there's the pre-landing Nazi run, where you must prove to the cabin crew your seat is in the upright position (despite the fact you haven't reclined the seat at all during the flight). Upon disembarkation, the customary thank you to the cabin crew (again, hiding in the galley), might get you an annoyed grunt in response. It's not much better in business class - where you might get a half-arsed meal, if you're lucky. Seriously, how hard is it to cater appropriately for 8 high paying passengers (where, again, serving passengers is seen as an imposition by the crew). Then there's the hard product. The ex-DJ aircraft stand out like the proverbial, with the tired looking interiors, that not even the red and purple seat backs can hide. Sure, the outside looks nice and fresh, but it's a whole different story inside. Compare that to QF - warm greeting by staff, a decent snack (at worst), or a fairly decent meal (at best), and a wide range of drinks (including soft drinks) available. If you have a particularly nice crew on board, they'll slip you a second drink too. Service is efficient, but the crew engage in a little chit chat with passengers. And the hard product - even if you do have an older plane, it still feels fresh. Even the customer service from the crew on JQ is much more personable than VA. JQ happily address passengers by name - even during the service. On my last flight, the passenger next to me was personally greeted by name and advised of their spending credit as part of their bundle package. I then bought a couple of items from the menu, but asked for a receipt. The crew then addressed me by name, and passed me an iPad to enter my e-mail address for the receipt. The fact that I got more personable treatment on a JQ flight than I did on a business class VA flight says it all really. Now it was only a few years ago Pam Ann's parody of Qantas was scarily accurate https://www.youtube.com/watch?v=rLEcid15gks&t=24s. Since then, they've improved out of sight with cabin refreshes, improved snacks, better crew engagement etc. You're even seeing that culture filter down to Jetstar. These days that parody could easily be applied to VA. There is hope for VA, and if the CEO can pull the staff into line, then that'll be a good start. We'll see what happens. I must be flying a different VA than you. My last few flights with them (admittedly in J) have been fantastic. The CS has been at the door greeting everyone with a positive personality, checking everyones boarding pass, and most will address each customer by name, every crew member has been smiling, happy to have a chat and get whatever a pax wants. The food has been amazing, and plentiful. I've had absolutely no complaints lately. Perhaps the worst thing is that I had a wait in the Priority lane in MEL a few days ago. You either had a bad day on VA (which I find is rare) or sought to be negative towards them. Also if there's turblence, hot drinks can't be served, on any airline (or shouldn't be) and it's part of their job to ensure that your seat is upright. I can’t remember the last time I’ve had a bad experience with VA.
I’ve never been on a flight where the check in staff, lounge staff or flight crews have been nothing but pleasant, friendly and professional. All about personal experiences of course. Some of this predates Borghetti - the 777s came in before he did and they were too much for them to use effectively at the time. They were chasing the US market which was a money factory for QF that they wanted to join, but it quickly dropped the allure as competition ramped up. They would have been better going for the Asian markets with smaller aircraft (332/333s) which at the time was something that QF was not doing at all well. I get the hot drinks thing - though not all passengers would. I've witnessed situations on VA where we've hit turbulence mid-service, but there was no announcement hot drinks would no longer be available, and passengers have been borderline reprimanded by crew for asking for a coffee. I get it's part of their job for seats to be upright, but when it is upright, and they're (rather aggressively) asking you to 'prove it', then that's poor customer service. I get every place has bad days - maybe it's just coincidence that the majority of my VA flights of late have been on 'bad days'. I didn't even mention the problematic IFE - which is a 50/50 chance of working based on recent flights. Not to mention the cumbersome IFE app. Open app - takes you straight to a website with the IFE offerings. Select your entertainment. There's a borderline lecture on 'you should be doing this on the app' as part of the selection on the website, before you are returned to the app to enjoy your TV show/movie. Last edited by brucetiki on Fri Feb 08, 2019 12:45 am, edited 1 time in total. I saw NZ's 1996 international route map and noticed a few routes to Asia via SYD and BNE. I haven't been able to find much information on these. Does anyone know if they had fifth freedom rights on BNE/SYD-BKK, BNE-TPE, BNE-SEL and similarly SYD-LAX? Thanks! Personal anecdotes are usually pretty weak data points in which to base any robust analysis, though. Different people experience the same event differently, e.g. the pax behind the seat that appears to not be upright is probably pretty happy to see some enforcement, and the crew need to know if there's a damaged seat both for safety and to notify for repair. Good days vs bad days. Myriad variables that aren't included in stories. They're interesting to share, but that's about it. More systemic issues like a frequent flyer programme, a fleet decision, routes and alliances, financial arrangements etc are far more valuable. 1. The impact of the Alliance/Qantas tie-up... did VA get snookered? 2. The pursuit of a transcon J product on the MAXs... I love the idea, but will it happen? 3. The 330 fleet's use domestically... things appear to have stabilised transcon but with the ramp up of a freight strategy, is VA starting to see some benefit to having all that belly space? 4. The ATR operation... is this a positive for the airline yet and is there a longer term strategy there? With a new CEO, there is usually some attempt at a change so it'll be interesting to watch. Last edited by aerokiwi on Fri Feb 08, 2019 12:45 am, edited 1 time in total. Must admit I have grown not to trust VA when organising holidays. When I was flying with kids a few years back, were in J plane sat on tarmac 3 hours to then have whole aircraft offloaded. Which is fine rather be in the ground than in the air with a mechanical fault. Moved to another aircraft which was then told no your not flying. We have moved to you to the midnight flight via melbourne as I watched them walking around picking the business passengers to give them boarding passes for the next flight. When I complained I was told they dont guarantee to get passengers to their destinations, kids were going mental. Kinda made me feel apprehensive when booking. Which is a shame because the J class product on the A330s is great and Ive always found cabin crew to go out of their way to help. Current examples (and granted some of these are being worked on). Even the First lounges are beginning to show their age. AU and NZ had open skies for 5th freedom rights. It also extended to domestic flights in each other countries, but none of the airlines took that up until QF (Jetconnect) in NZ in the early 00s (before JQNZ took over the QF-Jetconnect ops). QF also flew AKL-LAX and AKL-PPT (briefly) in the 90s with full 5th freedom rights before they eventually withdrew from both routes. There was something about NZ wanting to start domestic flights in AU in the mid 90s as part of "open skies" but government intervention on the AU side led to NZ investing in AN instead (and almost all of us knew what happened after that). Yes, they had full traffic rights on all flights via Australia. There was also Ansett New Zealand, but both Ansett New Zealand and Qantas JetConnect weren't using cabotage rights. They were wholly owned subsidiaries but with separate operating certificates administered by the NZCAA. Jetstar was actually the first airline to use the reciprocal cabotage rights, with the New Zealand operation being operated by Jetstar Airways, using VH registered aircraft, regulated by CASA. Already forgotten to history was Vincent Aviation that (briefly) operated SYD-NAA using ZK registered aircraft and regulated by NZCAA. Thank you SCFlyer, jupiter2 and RyanairGuru! I noticed on Airbus' order books there is an order from MACQUARIE FINANCIAL HOLDINGS PTY LIMITED. The order is for 40 A220-300 and 20 A320neo. Anyone think these are for an Aussie airline? It was a planned diversion, presumably due to strong headwinds being forecasted. I agree. The one thing I can't fault VA on is their inflight service. I find the FA's very polite and professional. The service on the ground however is a bit more spotty and from someone who is on a VA flight every week, MEL ground staff are generally excellent, BNE ground staff need the most uplift in service standards. Don't get me wrong, the inflight meals in Y need serious review and quickly and Velocity needs to mature but overall, I'm happy. No desire or need to switch at the moment. 40 A220s would cover for the combined fleet of 37 717s & Fokkers currently operated by QF. I doubt they're going to QF but it's worth a mention. More storms in Sydney sees another night of delays at SYD - they've even suspended the start of the AFLW match at Drummoyne so I can imagine what the storm's doing to flights. Yes, it seems to be one storm after another this week. MEL had a turn once again earlier in the week. 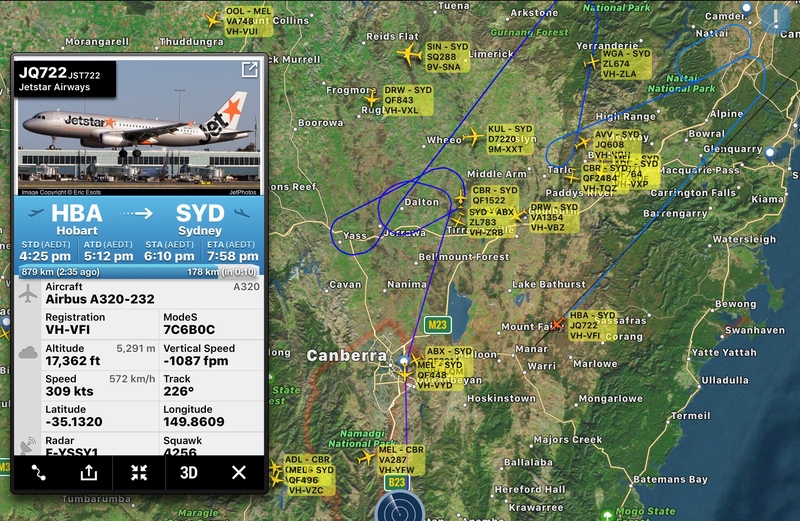 CBR got a HBA flight from MEL that evening, and it appears JQ722 from HBA will divert tonight - among numerous other domestic flights. I would love to be there this evening! EK416 is diverting to MEL. The colour of the sky is nearly as orange as the JQ branding. For reference, this order has existed since 2014. Looks like a few flights coming through - you can hear aircraft coming through semi-regularly on the footy coverage from Drummoyne. I was on QF MEL-SYD and for diverted back to MEL, pax given option to get off in Melbourne or go back to Sydney for round two but may not make curfew... few people got off not many. Bags remained onboard and will be sent back to MEL tomorrow. Great updates from tech crew, and quick Gas, and Go! I can’t speak highly enough of the cabin crew, mature QF ‘chooks’ - kept the pax happy and laughing. Service was impressive before diversion, chicken curry dinner service, then bar service then another bar service, then chocolates. Now another bar service back up to Sydney. Days like today QF wins hands down, these ladies have kept the cabin calm under control, but have know how to play the pax and keep them happy. Few grumps, but the ladies turned them round. Blanket curfew dispensation was given to 23:45. The bags of those that did not fly stayed on board? Isn’t that against aviation security protocols? The weather has been inane this summer. So many weather issues down the east coast. Not in some circumstances apparently. I suppose it depends if under pax control or not? eg, weather, diversion, medical etc captain and company security call. ZL 472 GFF-SYD was in a holding pattern over OAG for some time before finally landing at OAG. It continued onto SYD after the weather cleared. The bags of those that did not fly stayed on board? Isn’t that against aviation security protocols?. No - provided the pax took the initial flight, and actions arose outside their control (diversion), then they can deplane without luggage. I have done this before when my flight returned to original port, and there was no point trying to make a meeting I was attending despite the plane refueling and turning around to go again. Crew needs to get flight deck approval, but then no problems. No difference from luggage missing a connection and travelling separately day(s) later to meet a pax if you think about it. But for all those who like a bit of history PAPL have put up photos of 747s that have visited Perth over the decades on their Facebook page. There's a few good oldies..interesting seeing AirNz and Air India parked up next to each other, tho not sure why BA had those shocking different patterns splattered on the tail. It was the short lived BA world tails livery. It only lasted a few years IIRC. The tails of fleet were eventually repainted into the Union Jack (Chatnam Dockyard version) when BA got rid of the World Tails scheme. What amazes me about the B747 era would be the amount of stop overs vs today’s range of non stop services on twin engine aircraft. 747 stopovers... What can I say- fares were much higher and fuel was cheap. This explanation was very useful to me, thank you. About two years ago, I was meeting some friends off a VA flight and their checked bags didn’t arrive. When we went to the lost luggage, there were the bags! Turns out, because they had a connection of about three hours IIRC, their bags just went on ahead on an earlier flight?! But the pax didn’t know anything about it till they got to the final destination. Had never heard of that happening before, but your explanation helps solve that mystery. Maybe there was a need on that day to balance out the loads or something, available with two flights with the same departure and arrival destinations that morning? I don’t think it was a mistake. Can’t remember the exact reason given, but it wasn’t anything that didn’t seem out of routine..
My understanding as to why Australia Asia & several other carriers had 'Asia' divisions was created for flights to Taiwan. Had something to do with not upsetting the Chinese, who still consider Taiwan to be one of their provinces. All 'national symbols' are taken from the aircraft (Flying Kangaroo for Qantas, the crown with KLM, colors of the flag with Air France, the Cross for Swissair, Union Jack for BA). Same same but different why Virgin Blue wasn’t permitted to utilise the Virgin brand on the Pacific route until JB signed an agreement with SQ & then Virgin Australia was born. Last edited by EK413 on Sat Feb 09, 2019 11:10 am, edited 1 time in total. The rumours about trash yields and too much capacity must be true. Surprised SFO-SYD didn’t suffer especially with QF now operating MEL-SFO. I know United Airlines will begin direct flights between Melbourne and San Francisco in October 2019. I’m guessing that UA will want SFO to be their main connecting Hub for SYD during the low season, whilst LAX and IAH flights will suffice O&D demand for those markets. The airline will still offer a double daily service to SYD, I am surprised that LAX did get chopped down a little. UA will still operate MEL-LAX daily, so UA will still have a daily presence to Australia exLAX during that period. I hope that MEL-SFO performs well for UA, it’s been a long time coming, however they are less concerned about connecting traffic and focus more on O&D with that flight. A world built upon connectivity.